L&L offer a spit hire service that is sure to make your next event the most memorable of the year. Our spit can hold up to 30kg of meat, which the boys at L&L can marinate and thread on for you. We also offer Australian Red Gum Charcoal, which will offer you a slow burn long into the night. 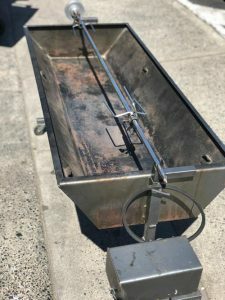 With a $100 deposit, you will be able to hire the spit for two or three days, and will receive $50 back when it is returned in working and clean condition. We are able to offer a deliver-to-the-door service at L&L. If you place an order, either on the phone, through our social media, or over email, we will be able to deliver this order to you the next day. The minimum order for this service is $100. L&L Master Butcher, 452 Centre Road Bentleigh, is proud to service some of the finest restaurants and golf club in the Metropolitan Melbourne area. Testimonials from a handful of these restaurants can be found in the ‘about’ tab of the website, and they demonstrate why our personalised service and high quality products are loved by our wholesale customers.